Defamation like any other law requires a balance of rights, being the public right to freedom of speech and the private right to protect one’s reputation. Judgements such as Hockey v Fairfax Media have highlighted the contentious legal principle and reignited debates as to whether said laws are a tool of oppression or a private protection. In response, undeniably defamation laws in their current state fall short. Irrespective, it is within the best interest of the public to refrain from repealing defamation legislation and alternatively reviewing and engaging in law reform. Any society that values justice needs to allow protection for individuals and business from malicious intent causing severe damage. Balancing of rights is achievable through defamation reform. The democratic ideal of The Rule of Law dictates that citizens are to have equal accessibility to the law. However, defamation has proven a law for the elite, utilised by corporations and the affluent to pacify the individual and/or the media from publically scrutinising or condemning. Federal Treasurer Joe Hockey’s awarding against Fairfax Media exemplifies this notion of elitism. Newspaper headlines titled ‘Treasurer For Sale’ and two tweets were determined “malicious” and demeaning of Hockey’s reputation to the “ordinary, reasonable reader”. Considering the nature of Public Office, the enactment of the “public figure” defence is appropriate. The proposed defence would work harmoniously with the current defences of justification, privilege and fair comment. This would ensure accountability for those in prominent positions through higher thresholds of proof, de-incentivising politically motivated trials. Costliness, intimidation and extensive time delays have cause the layperson to fear accusations of defamation. This culture of fear has allowed corporations to threaten individuals into refraining from discussion. Introducing a preliminary avenue before admission to the court such as Alternative Dispute Resolution Mechanisms minimises current reservations. Alternative resolution is more effective at balancing the interests of both parties, whilst removing the intimidation of presenting arguments before a court and in opposition to learned legal professionals. This would ensure cost effectiveness, minimise time constraints given resolution occurs within the preliminary stages and facilitates a law a layperson feels more inclined to engage with. Public trust in the judiciary is vital in ensuring a functional Separation of Powers and good governance. The function of the court is to hear evidence and weigh the individual’s rights, societal values and policies. The court considers, penalises or dismisses on a cases by case basis. Considering this, the fear that the court will order a large compensation payout is unfounded. Judges are trained to use discretion with subjective facts, such as the motivations of parties, power imbalances, determining malicious intent and subsequently make proportional judgements. Eliminating or minimising monetary payouts as the main source of compensation with a replacement order of apology, would de-incentivise the affluent oppressing the layperson. Apologies could occur in the same fashion as original defamatory comments, upon the same medium, to the same audience or to an equal or greater extent of prominence. This reform has the potential to remove negative public perceptions and fears. Freedom of Speech is an inextricable value of a functional democracy, as is granting rights and protections. Defamation safeguards individuals and businesses that suffer great loss at no fault of their own. Reflection and reform can ensure a balance of the freedom of expression Australian’s hold dear, without severely demeaning the reputation of others. Defamation — Judicial Commission of New South Wales. 2015. Defamation — Judicial Commission of New South Wales. [ONLINE] Available at: http://www.judcom.nsw.gov.au/publications/benchbks/civil/defamation.html. [Accessed 09 August 2015]. Defamation law and free speech. 2015. Defamation law and free speech. [ONLINE] Available at: https://www.uow.edu.au/~bmartin/dissent/documents/defamation.html. [Accessed 09 August 2015]. Defamation Law, Defamation Lawyers | Slater and Gordon. 2015. Defamation Law, Defamation Lawyers | Slater and Gordon. [ONLINE] Available at: https://www.slatergordon.com.au/dispute-resolution/defamation-law. [Accessed 07 August 2015]. Deformation Facts, information, pictures | Encyclopedia.com articles about Deformation. 2015. Deformation Facts, information, pictures | Encyclopedia.com articles about Deformation. [ONLINE] Available at: http://www.encyclopedia.com/topic/Deformation.aspx. [Accessed 08 August 2015]. Joe Hockey has no regrets over defamation suit against Fairfax Media; Treasurer to recover only small fraction of legal costs – ABC News (Australian Broadcasting Corporation). 2015. Joe Hockey has no regrets over defamation suit against Fairfax Media; Treasurer to recover only small fraction of legal costs – ABC News (Australian Broadcasting Corporation). 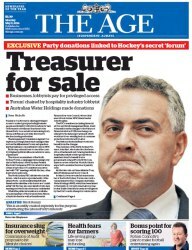 [ONLINE] Available at: http://www.abc.net.au/news/2015-07-22/joe-hockey-court-defamation-costs/6639246. [Accessed 10 August 2015]. Joe Hockey v Fairfax case highlights costs and risks of defamation litigation. 2015. Joe Hockey v Fairfax case highlights costs and risks of defamation litigation. [ONLINE] Available at: http://www.smh.com.au/federal-politics/political-news/joe-hockey-v-fairfax-case-highlights-costs-and-risks-of-defamation-litigation-20150722-gii69k.html. [Accessed 04 August 2015]. Joe Hockey’s defamation case just cost him $500,000 | Business Insider. 2015. Joe Hockey’s defamation case just cost him $500,000 | Business Insider. [ONLINE] Available at: http://www.businessinsider.com.au/joe-hockeys-fairfax-defamation-case-just-cost-him-about-500000-2015-7. [Accessed 04 August 2015]. The argument for anti-defamation laws | Daniel Meyerowitz-Katz. [ONLINE] Available at: https://danielmeyerowitzkatz.wordpress.com/2014/03/01/the-argument-for-anti-defamation-laws/. [Accessed 07 August 2015].